So, Nigeria Is World's Poverty Capital? The co-founder of the Bill and Melinda Gates Foundation, Bill Gates, has reiterated the need for African governments, especially Nigeria and Democratic Republic of Congo (DRC), to invest more in human development as this is the only sure means to curb the rising poverty level in both counties. Mr Gates in a telephone press conference ahead of the Goalkeepers event in New York said most African countries especially Nigeria and DRC need to channel more investment towards health, family planning and education as a means of human development as this is the only way in which poverty can be alleviated in the continent. Mr Gates was speaking based on the Goalkeepers data report which said by 2050, more than 40 per cent of the extremely poor people in the world will live in just two countries: Democratic Republic of the Congo and Nigeria. The projection is that since Nigeria in March 2018 took over from India the unenviable spot of the largest number of extremely poor, the DRC could soon take over the number two spot. Although the Nigerian economy is out of recession, many Nigerians have slipped into extreme poverty. In 2016, the prevalence of people living below the poverty line ranged between 54 per cent and 60 per cent. About 82 million Nigerians are estimated to currently live below thepoverty line of access to less than $1.9 a day. By the end of 2018, in Africa as a whole, there will probably be about 3.2 million more people living in extreme poverty than there is today. Africa already accounts for about two-third of the world's extreme poor; and if the current trend persist, Africa will account for nine-tenths by 2030, analysts say. Fourteen out of 18 countries in the world where the number of extreme poor is rising are in Africa. Speaking on the Goalkeepers data report released some days to the event, Mr Gates said Africa is a young continent so there is a need to invest in young people. The report is the second edition published by the Bill and Melinda Gates Foundation to discuss several aspects of work done across the globe. The first Goalkeepers data report was published in 2017. The aim of the report is to track progress on 18 key Sustainable Development Goals indicators and analyse promising approaches to achieving the goals. According to the report, poverty in Nigeria and DRC is concentrated within certain areas and in a very unique form. It said the increasing poverty rate in these countries are largely as a result of the ongoing violence in the regions, political instability, gender inequality, severe climate change and "other deep seated crises". Other factors identified as intensifying the poverty rate include the high rates of child mortality and malnutrition. "As a result, today's poorest people have significantly fewer opportunities than most of the billions of people who escaped poverty during the first two waves," it said. Mr Gates said the conclusion is clear: "to continue improving the human condition, our task now is to help create opportunities in Africa's fastest-growing, poorest countries. Specifically, it means investing in their health and education, or what economists call, human capital." Mr Gate explains further: "in this year's Goalkeepers report, we take an honest look at the challenges presented by the demographics of extreme poverty. We explore what it will take in the areas of health, education, and economic opportunity to position Africa's booming youth population to transform the continent." The Goalkeepers event is holding September 25 and 26, the same week as the UN General Assembly meeting. Mr Gates said the foundation is excited about the Goalkeepers event. "It is a unique opportunity to get together people who are committed to making the improvements that are talked about in the Sustainable Development Goals." "The opportunity we have is to talk about where things are going well, to highlight whether it's new science or heroes in the field, but also be quite frank about where things are not going well and talk about what we should do to get back on course," the billionaire philanthropist said. The report further said that nearly 60 per cent of Africans are under the age of 25 compared to 27 per cent of Europeans. It said human capital is not a magic bullet, "but has played a pivotal role in the success of emerging economies around the world". "Young people in the poorest countries are denied opportunities to build better lives as people worry about insecurity, instability, and mass migration. Projections show that human-capital investments can do the same for the poorest countries in Africa. "We wish they would also recognise young people's enormous potential to drive economic growth. They are the activists, innovators, leaders, and workers of the future. Investing in young people's health and education is the best way for a country to unlock productivity and innovation, cut poverty, create opportunities, and generate prosperity." In sync with the report, Mr Gates encouraged the political leaders to invest more in human capital development. This is not the first time Mr Gates is advising Nigeria to invest in human development for its sustainability. 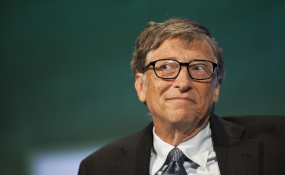 Mr Gates during his visit to the country in March said that the government needs to re-evaluate its economic blueprint because it does not prioritise investment in human capital. He said the Nigerian government's Economic Recovery and Growth Plan (ERGP) identifies "investing in our people as one of three strategic objectives but the execution priorities do not fully reflect people's needs: prioritising physical capital over human capital". According to him, human capital is a prerequisite for economic development. He explained that it may be easier to capture the importance of investments in human capital by analysing the impact they have on individuals. "Across sub-Saharan Africa, these investments could increase the size of the economy by nearly 90 per cent by 2050, making it much more likely that the poorest countries can break through their stagnation and follow the path of China and India. There are blueprints for investing successfully in human capital," he said. Mr Gates added that if the countries and developmental partners invest more in human capital today, "young people wearing sandals in the poorest, fastest growing countries will be riding bicycles tomorrow--and inventing cheaper, cleaner, safer cars next week and that's good for everyone."